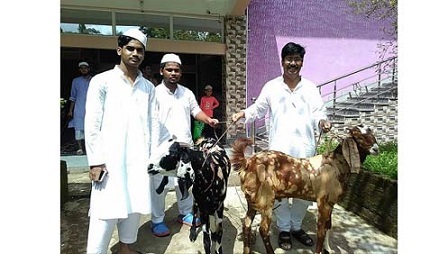 The BJP MLA from Sonai constituency in Cachar, Aminul Haque Laskar, has brought two giant goats far away from Rajasthan to sacrifice (‘qurbani’) the same on the auspicious occasion of this Eid al-Adha. The MLA has done all these for “a change”. These two goats travelled for 15 days by road to arrive at Silchar. While one of the goats weighs around 56 kilograms, the other weighs 84 kilograms. Eid al-Adha, the ‘Festival of Sacrifice, is also called as the ‘Sacrifice Feast’ or ‘Bakri Eid’. On the occasion of the festival, the meat of the animal brought for sacrifice is divided among the family members, relatives and friends besides the poor in equal parts. The meat of the goats brought by the MLA would also be on everyone’s platter for a sumptuous meal on the occasion of Bakri Eid on Wednesday night’s dinner.